Last February you might recall that I took the 1968 Airstream Caravel out to Palm Springs for a few days. It was one of eight vintage trailers on display at the ACE Hotel, which was a small part of the big Modernism Week even that takes over Palm Springs every year. The event was surprisingly popular, considering the small number of trailers that were on display. Over 600 people came through to tour the trailers, inside and out. So I proposed to the organizers of Modernism Week that R&B Events (our little company that organizes Alumapalooza) get involved and try to make the event larger. They accepted, and so during February 25-27, 2011, we’ll have 18 really exceptional vintage trailers on display at the Riviera Resort & Spa in downtown Palm Springs. Most of them will be 1960s Airstreams, including a Bambi, two Caravels, two Globe Trotters, a Trade Wind, a Safari, and a Caravanner. All of them will be completely restored, whether customized or original. In addition, we are expecting several interesting non-Airstreams. 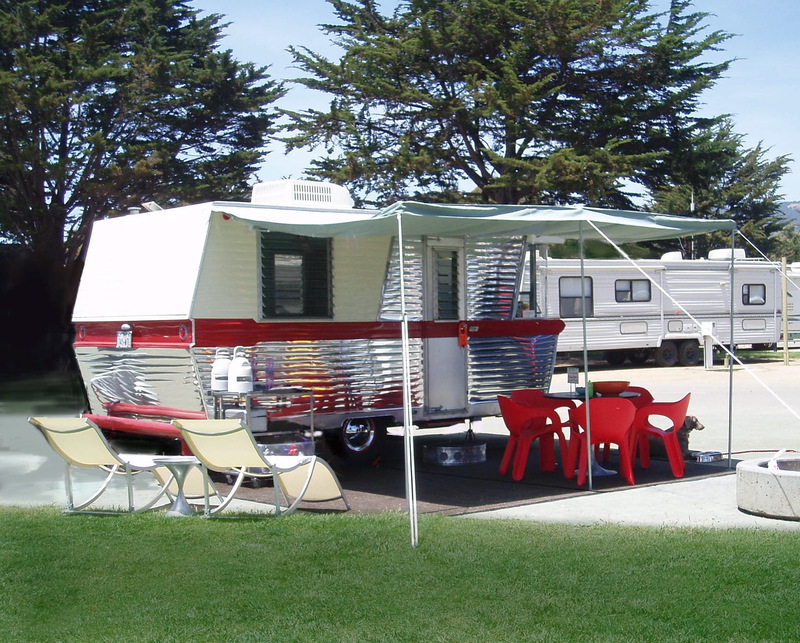 Already signed up are a 1935 Bowlus Road Chief, a 1960 Holiday House (pictured at left), and a 1950 Airfloat Landyacht. If you went to Alumapalooza in 2010, you might have seen John Long’s Bowlus already — it’s absolutely stunning. Pictures of it were also featured in a recent issue of Airstream Life. Kristiana Spaulding will be there with her “silver trailer” jewelry and her Caravel. She’s a fun person to chat with, since her interests encompass many aspects of design including jewelry and vintage trailers. She and her husband Greg own a small fleet of trailers, some of which they rent for vacations. John Byfield and Kate Heber will be there too, with their customized “Eco-Discovery Tour” Airstream (a 1962 Flying Cloud). This trailer was featured in Airstream Life. It’s sort of a rolling showcase of alternative ideas and materials that can make everyone’s life greener. You can see some pictures of it on their website. If you’d like to come see the show, you should check out the Modernism Week website. There’s a free “exterior” (closed-door) showing on Friday, February 25. You can just show up at the Riviera Hotel and wander around from 5 pm to 8 pm. Open-door tours, where you can see the interiors and talk to the owners, will be Saturday and Sunday, Feb 26-27. There’s an admission fee for the interior viewings on the weekend, which I believe will be $15. Hours are 10 am – 3 pm Saturday, and 9 am – 1 pm Sunday. There will also be several vendors on site, with all kinds of modernism / vintage trailer inspired goodies. I believe that David Winick, creator of the Airstream 75th Anniversary Bambi, will be there with his new book, too. At this point we’ve got 12 trailers signed up to participate. We haven’t made a public call for participants up till now, because it’s an invitation-only event. The trailers have to be approved before they can be in the show. This is to ensure high quality for the people who are buying tickets to tour the trailers. Plus, we only have space for 18 trailers. But it’s a heck of a deal. 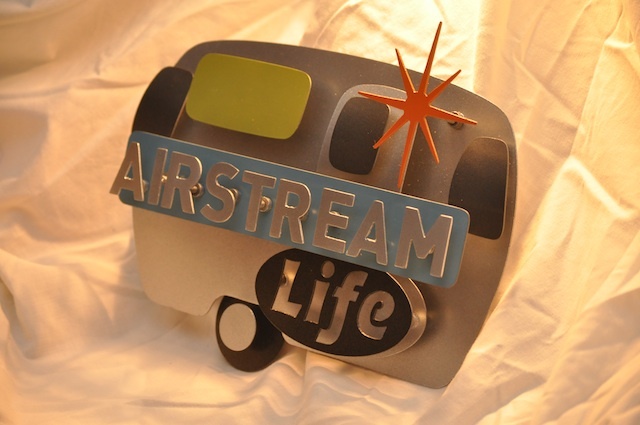 For an $85 entry fee you get two free nights in the Riviera hotel, two receptions, lots of fun, and the chance to win the new “Airstream Life Award,” hand-made by Stevo Cambronne. (The award is something new we’ve developed. Two will be given to great trailers at Modernism Week, and we are also planning to give a couple away at next year’s Alumapalooza in Jackson Center OH.) Just hanging with the other owners should be worth the entry fee, since they are all interesting and motivated people with great restoration talents. So if you’ve got a nicely restored vintage trailer of any make, and would like to attend, send me a few photos (use the Airstream Life “Contact Us” form to send an email and I’ll reply with an address). But hurry! We’ve only got 6 spaces left, and they are going fast. Whether you’ve got a trailer to show, or just want to come through and see them all, I hope to see you in Palm Springs next February! Does the Riviera have more going for it than the Ace Hotel? Yes, the Riviera is a full-scale hotel with gorgeous pool and great amenities. Very upscale and trendy interior design. You sort of have to see it to believe it, but maybe I’ll post a picture of it in a future blog. Yep, sorry Jim, it’s too late. We filled all 18 spots a few weeks ago. But consider us for 2012 — we’ll have more room next year! Can’t wait for this show!! !